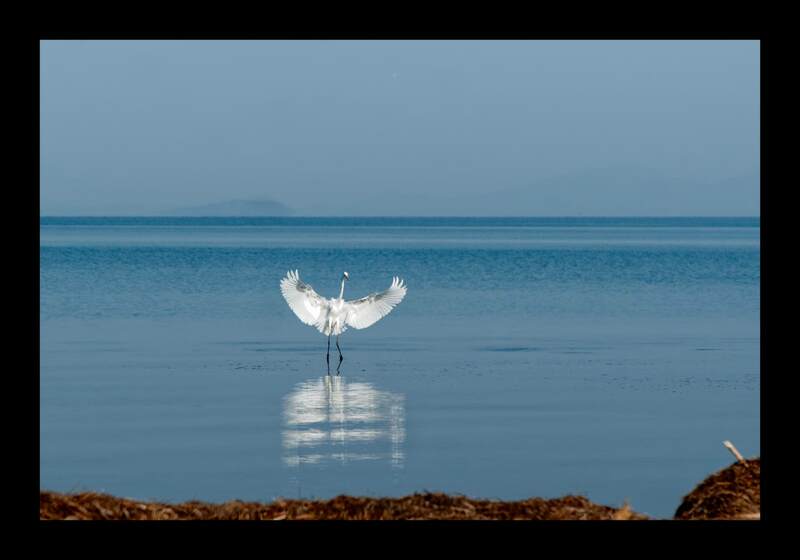 An egret landing at sea, by the shore. I made this photo shortly before the Mountainous Landscape photo I presented in the past. I’ve been trying to make a good photo of the egrets in that marshland for years. Naturally, wild birds are afraid of humans and they usually fly away from people. In most cases, shooting something from the back makes a rather uninteresting photo. So, it takes a lot of patience and many tries to make a photo of wild birds. All this patience paid off for me in this photo. Many people were talking about dolphins swimming near the beach in the mornings. So, one day I went there to see if I would be lucky. In regards to dolphins, I wasn’t. But I was lucky with the egrets. There were some of them in the area but they kept their distance. At some time I spotted an egret flying almost parallel to the shore and approaching my location. I began snapping shots as it got closer. This meant I was ready when suddenly, it turned and landed near the spot I was standing. Of course, I took many shots after it turned towards me but this was the most impressive of them all. It makes me wonder if birds remember and trust people over time.